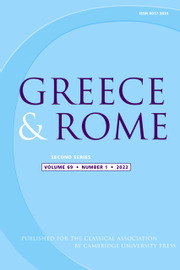 Greece & Rome is a journal which delivers scholarly research to a wider audience. It showcases original and informative articles on ancient history, literature, art, archaeology, religion, philosophy, and reception of the ancient world. Although its content reflects current research and its contributors include leading figures in the field, undergraduates and general readers who wish to be kept informed of current thinking will also find it engaging and accessible, as well as professional scholars in Classics and in other disciplines. With the wider audience in mind all Greek and Latin quotations are translated. A subscription to Greece & Rome includes an annual supplement of New Surveys in the Classics. Note: The word limit for submissions to Greece & Rome has increased to 10,000 words. If you have engaging and accessible scholarly research that you want to reach a wider audience, including undergraduates and general readers who wish to be kept informed of current thinking, please consider submitting to the journal. Click here for the instructions for contributors, and please contact the editors if you have any queries.